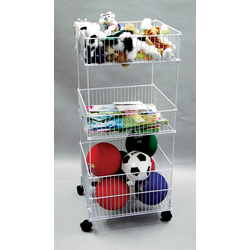 This wire dump bin is multi-level with several sized bins to accommodate different types of merchandise. Open wire design allow customer to view the contents of each bin. Rolling casters allow bin to be placed conveniently in your retail space. Simple design fits in well with pre-existing decor.